Some of the maps below are photos [JPEG files] and have no “functional” features. Simply click the image to view it apart from the text; click your browser back-button to return to page. Maps which are viewed by clicking a link to Connecticut Historical Society’s eMuseum do have “functional” features: zoom, pan up, pan down, etc. The links to maps at Historic Mapworks also are functional ONLY if you open a “free” account–and then deposit $10 into your account [on their secure site] via credit/debit card. This allows you to use “Enhanced Zoom” 250 times with no additional charge per view. With this feature, you actually can zoom in close enough to read the name of a house’s owner. LINK PROBLEMS: Links, such as those below [or elsewhere on this City Point website] often become obsolete as editors of linked sites make changes. If you have trouble with any of the links below [or elsewhere on this website] please report it to this editor. The unnamed street marking the Northern boundary of the Oyster Point Quarter is Columbus Street [later called Columbus Avenue]. The part of the bed of the unnamed creek just North of Columbus Street will become the Derby Rail Road in 1870. This creek merges with West Creek, the location of which is now covered by Route 34. Notice the distinct elevations separating The Oyster Point Quarter from Sodom Hill [later called Mount Pleasant and finally The Hill]. This map from the very first City Directory shows a “contemplated” development—dubbed City Point. Cf. maps above & below for actual depictions of Oyster Point from this era. The planner [G. Hallock?] shows the West River salt marsh filled with roads, but an angled road & bridge to West Haven [i.e. Kimberly Ave] is not envisioned. The proposed development essentially covers all of Hallock’s land from Spring St. southward. The “Contemplated Wharf” at the end of City Point instead would become site of discharge pipe for raw sewage. Approximately 160 years later the pipe would become the foundation for the present City Point pier, at the Sound School. “A member of the board mentioned that a young gentleman was desirous of compiling a directory and affixing numbers to buildings in the City.” [Nov.12, 1839 meeting of the Court of Common Council, predecessor of the Board of Aldermen]. This map was in the front of city directories for much of the 1840s. Being intended primarily as a nautical map, this has one of the best drawings of the West River salt marsh, clearly showing the western boundary of the “point” (narrow peninsula) i.e. Oyster Point [although the term Oyster Point Quarter referred to a much larger area, extending northward to Columbus Ave.: i.e. all of that portion of New Haven bordering the harbor’s original western shore]. The small farm house owned by Hallock [which he rented to a tenant-farmer] is clearly shown, as is the outcropping upon which his home rested [although his “Castle” is not depicted]. Most of the point appears to be under cultivation. There are no houses on the southern tip [future site of South Water Street], but these will begin to appear shortly. The dark line left of Hallock’s Castle is a ropewalk [long building for manufacturing rope]. Most homes shown are on “New Streets in the Oyster point quarter” surrounding Spireworth Village [later called Trowbridge Square]: Carlisle, Port-see (Portsea), Salem & Cedar Sts., which, along with nearby Putnum & Liberty Sts., were approved by the Court of Common Council [predecessor of Board of Aldermen] on Sept. 3, 1830. The homes just north of Spireworth Village are in Sodom Hill [later called “Mount Pleasant” and finally “The Hill”], separated from the Oyster Point Quarter by a small creek [although, adding to the “neighborhood identity” confusion, some 1830s deeds of properties south of Spireworth Village describe them as being in “Mount Pleasant”. See http://nhpt.org/index.php/site/district/trowbridge_square_historic_district/.] Notice that the “point” is part of a much larger peninsula, bounded by the West River on the west, and West Creek & New Haven Harbor on the east. This peninsula incorporates both Sodom Hill [aka Mount Pleasant aka The Hill] and The Oyster Point Quarter. This—plus significant infilling of waterways from the 1860s to 1950s—will account for over a century of on-going disagreement over what constitutes the Hill neighborhood and the City Point neighborhood. The image below is a close-up excerpt at the left edge of the image in the above-link, showing “Hallock’s Castle”, as viewed looking across the harbor from Water Street, i.e. from the opposite side of the harbor (with the viewer standing approximately where The Metropolitan Business Academy is now located!). Just above the intersection of Lamberton & Cedar Streets one can see the semicircular outcropping in front of Gerard Hallock’s mansion [“Hallock’s Castle”]. Scroll down to the end of Oyster Point and note that the only road is Howard Ave. The only buildings visible are a house owned by Hallock (which he rented to a tenant-farmer) and buildings on the shore owned by R. Law [109 South Water St.] and W. Barnes [103 S. Water St.] & a house at the end of Howard Ave. [19 Howard Ave., Eber Kelsey]. The raised cellars of these 3 houses have direct beach access, so oyster shucking & packing takes place here. This malodorous use of residences soon will change, as the oyster industry experiences tremendous growth throughout the second half of the 19th century. [Cf. 1868 wall map below] Early advertisements of R.W. Law claim that the company was founded in 1847. However, land records [v.123,p.404] show that William S. Barnes was the first oysterman at the Point, purchasing c. 2 acres of harbor-front between the West River and Howard Ave. from Gerard Hallock in 1847. Barnes then sold some of this land to Denison Hall the following year. Richard W. Law purchased the parcel depicted on this map from Hall in 1850 [although it’s possible that Law initially worked from leased property, beginning in 1847 as the advertisements claimed; in an old, undated newspaper clipping given to this editor, which includes an interview of Law’s son, he claims that his father founded the business in 1850]. Eber Kelsey is found in the 1852 city directory as “shipmaster” living at 20 Wallace St. However, directory information was gathered the preceding year, so his house likely was built the year this map was published: 1851. He is not found in the directory again until 1855, as a partner in [Frederick]Lane, Kelsey & Co., along with Charles Lane “mariner”. (Other Lanes were living on Wallace St. when Eber Kelsey lived there, so perhaps that is where the partnership was formed.) Richard W. Law & William S. Barnes of Oyster Point are listed in the city directory for the first time in 1852, again based on information gathered the preceding year. So, even though they owned land before that, perhaps their homes also were not built until 1851. By 1854 Alexander Foote “oyster dealer” also was working on the Point, and by 1857 a new partnership “Kelsey & Foote” had been formed. 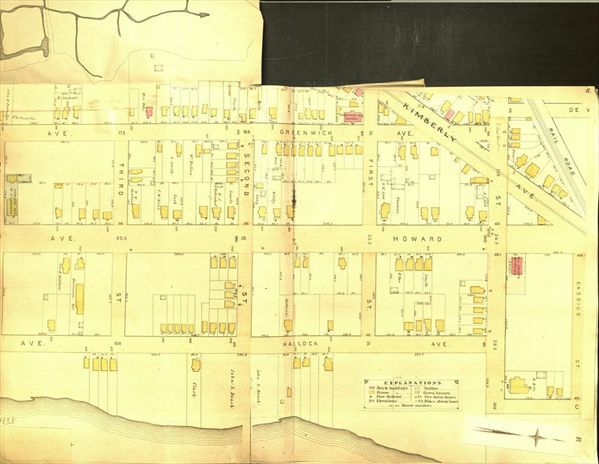 By the time this map was created, Hallock owned not only most of the land from Spring St. southward, but also had invested in lots around Spireworth, aka Trowbridge Square, and paid for the 1851 construction of South Congregational Church on Columbus Ave., which you can see by scrolling up. [Due to the massive influx of Irish Catholic rail road workers, in 1875 this became the Catholic Church of the Sacred Heart, which closed in 2009.] Also, scroll to the right and follow West Water Street from Hallock’s mansion over to the intersection of Fleet Street [which today is the last southbound block of State St., alongside the Knights of Columbus Museum] , where the Long Wharf begins and extends 3/4 mile out into the harbor. One block of West Water St. [where it intersected Fleet] survives behind the present Police Headquarters on Union Ave.—an obscure reminder of just how far north New Haven Harbor once reached. The original of this map is 25 1/2″ X 35 1/2″, so much detail was lost when reduced to accommodate this website. The title reads “Map of Building Lots in the City of New Haven Belonging to the Heirs of GERARD HALLOCK, Decd. Surveyed Nov. 1867 by Wm. Hartley C.E., Dep. Surveyor General.” This is a surveyor’s map, so Hallock & Greenwich Aves. & the numbered cross streets had not yet been constructed. Many of the corner lots depicted facing Hallock & Greenwich Aves. soon were subdivided by developers to build small houses facing the numbered cross streets [like the house this editor lives in!]. The two railroad tracks crossing Lamberton read “N.H.& N.Y. R.R.” [= New Haven and New York Rail Road. Later there would be 5 tracks, today 4.] The unnamed creek traversing the salt marsh originates near Kimberly Ave., between Second & Third Sts. [This varies somewhat on other maps; some maps show Kimberly Ave. narrowed to accommodate the mouth of the stream, e.g. see 1868 Wall Map, below.] Script under title reads “State of Connecticut County of New Haven. New Haven Jany.24th 1868 Personally appeared Chas.B.Hotchkiss the signer and sealer of the above Certificate and acknowledged the same to be his free Actual deed before me.William S.Leonard[? ]Town Clerk”. —thus marking the official establishment of the new housing development called City Point. Not much detail in this map, but note that the Kimberly Avenue bridge crosses two islands. Another excellent depiction of the West River salt marsh, showing the outline of the “point” (narrow peninsula) from which Oyster Point/City Point derived its name. The grid of new streets is shown. Hallock died in 1866, so the farmhouse he rented out [@ Fifth & Howard] is labelled “Hallock Est[ate]”. His home on Cedar St. has not yet been moved, but now is owned by the “N[ew] Y[ork] & N[ew] H[aven] R.R. Co.” West Water St. already has been obliterated by the rail road co. The name “Oyster Point” is placed between Fifth & Sixth Sts. where Bay View Park later will be developed. The West River salt meadow encroaches on part of Kimberly Ave. Down the center of Kimberly Ave. is the horse-drawn railway between “New Haven,West Haven & Savin Rock”. By the 1890s this will be electrified & extend down Howard Ave.
Investor M. C[lark] owns some land. The [City Point] School is depicted. The 2 oyster cos. on the 1851 map [Law, Barnes] still exist, now joined by J[eremiah] Smith, W[illis] Smith, R.Tyler, C.Lane, E.Lane, plus E[ber] H.Kelsey [owning the house shown but not named on 1851 map], A[lexander]Foote,F.Lane, M.Manson, Mrs.[Von]Glahn, McNeal, Geo.Smith. The only house on Sea Street is L[ozelle] Foote. Most company owners live on the north side of South Water St [the so-called “oyster houses”] with actual business now taking place in Oyster Barns constructed on in-fill on the South side of S. Water St. [Original houses no longer have direct shore access.] In-filling had begun by at least 1860 when South Water St. first appears in the City Directory. Sea Street first appears in L. Foote’s 1866 property deed; property deeds of 1854 describe it as “a new street”, and for a number of years before that as “a cart path”. This Directory map uses the traditional name Oyster Point. However the text of this 1870-71 Directory is the first New Haven Directory to describe two new streets as being in City Point—Second Street and Greenwich Ave—& describes the City Point School at 20 Howard Ave as being in City Point. Thus the names Oyster Point & City Point slowly begin to be used interchangeably. It’s difficult to see in this image, but West Creek & its branch North of Columbus St. are still visible. In the 1879 “birds eye view” they have disappeared. See below. Intended primarily for nautical use, this 1872 map has a very clear depiction of the West River salt marsh (aka salt meadow) between Greenwich Ave and Kimberly Ave. In 1868 the Hallock family had begun selling building lots between Sea St and First Street, as well as the southern side of Lamberton St (between Hallock Ave and Howard). Four years later, the greatest concentration of new houses in City Point is at the intersection of Greenwich Ave and Second Street. This cluster of houses is like a small village, with its own grocery store at 86 Second St, run by Francis Hogan. He and his family lived in the apartment above the store. By 1860 the southern beach had been extended to accommodate a new privately-owned street—South Water Street—with the oyster-related activities now taking place in oyster barns built upon additional infill on the opposite side of South Water Street. Due to the oyster industry’s rapid growth, the city drew up a plan in 1872 to take over and widen South Water St., although this plan was not carried out until 1886. 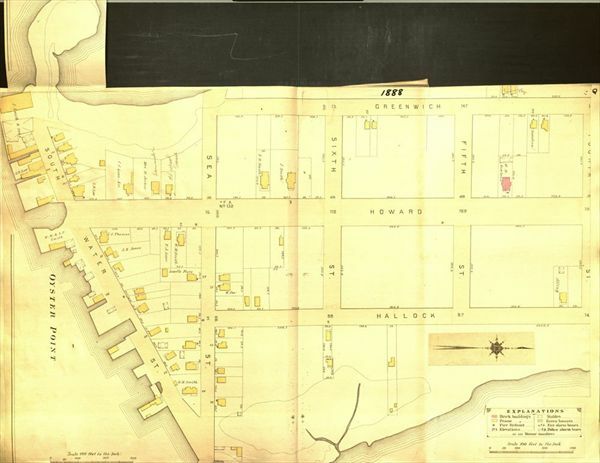 “The City of New Haven has taken for the definite layout of South Water Street from the Easterly line of Greenwich Avenue extended, to the Southerly line of Sea Street a strip of land sixty feet (60′) wide, or so much of said strip as was not already dedicated to the use of a street from the owners fronting on said strip” (Land Records, City of New Haven: Vol. 380, p. 471, March 3rd, 1886). The planned extension of Greenwich Ave. from Sea St. to S. Water St., referred to above and shown in this 1872 map as well as in the 1867 map commissioned by Gerard Hallock’s heirs, never was carried out. Topographical map, from a survey made for the City of New Haven by the United States Coast Survey in 1877. Inland portion executed by City Engineer’s Office. Compare with the 1868 wall map above: a few more buildings have been added to the waterfront oyster village [established when William Barnes purchased land here from Gerard Hallock in 1847]. In the nine years since they first were offered for sale, relatively few of the Hallock family’s City Point building lots [between Lamberton & Sea Streets] have been sold. Most of the new homes are in a cluster of modest “workers’ houses” around the intersection of Second St. and Greenwich Ave., built c. 1868 to c. 1871. The block of Greenwich between Third & Second seems to include 338 [with its unusual bargeboard], 348,352,356 & 362; the 2 lonely houses on the next block southward are likely 296 & 262, which remarkably have undergone few alterations [thus far…]. The row on Second St. are 86 [a corner grocery owned by Francis Hogan], 84, 80 [originally an exact duplicate of 84], 78 [originally a rare vernacular Gothic], & 76 [destroyed by fire c. 1990]. The single house near the corner of First & Howard likely is 317 Howard, an Italianate Villa whose square porch posts later were replaced with round Colonial Revival posts. 221 [?] Howard also can be seen [with bargeboards identical to 338 Greenwich]. Heading south on Greenwich Ave., the next 2 houses on the next block are likely 233 & 229 Greenwich Ave.
Only a small portion of City Point is visible on this map: Lamberton to Second St. Note that “Hallock’s Castle” now has been moved across the street to the corner of Lamberton & Cedar Sts. [and is now owned by the New York, New Haven & Hartford Rail Road], and the portion of New Haven Harbor that the “Castle” once overlooked is now filled in. Note that the harbor still extends northward to approx. Second St. & Hallock Ave. before the shoreline veers eastward. [When it has been digitized and put online, the copy above will be replaced with a link to a “functional” copy. In the meantime, you can examine the original—plates 1 & 2 are Oyster Point/City Point—at the library of the New Haven Museum & Historical Society, or in the land records vault at the New Haven Hall of Records, or in the map room of Yale’s Sterling Memorial Library or at these libraries http://www.worldcat.org/title/atlas-of-the-city-of-new-haven-connecticut-from-the-triangulations-surveys-and-maps-of-the-city-engineers-department-published-under-a-contract-with-the-city-of-new-haven-through-the-special-committee-of-city-maps-henry-g-lewis-chairman/oclc/6997908 ]. 1901 Insurance Maps, New Haven, Connecticut, Vol. 2, Sanborn-Perris Map Co. The following links go to a digital copy of the entire volume. Another Historic Mapworks map: very detailed map that includes the upper half of City Point. Perhaps most startling to modern viewers is realizing that New Haven Harbor used to extend along the entire length of Hallock Avenue. With the construction of Interstate 95 [CT Turnpike] in the 1950s as well as Interstate 91 and the widened Route 34 [Oak St. Connector] in the 1960s, a huge section of the harbor was replaced by One Long Wharf’s parking lot; Jordan Furniture; Regional Water Authority; Sargent/Assa Abloy; the food terminal/Brazi’s/Long Wharf Theater; a Mobil gas station; a bank; La Quinta Inn and Ikea: all constructed on infill of New Haven Harbor! See this editor’s more detailed descriptions in the three 1911 Atlas links above: the Boulevard actually did not yet extend between Kimberly Ave & Sea Street until 1929 and most of what is now Kimberly Field was still a salt marsh until the mid-1930s. You’ve done an admirable job of researching our roots. Thank You. Now I’d like to know if you have any information about my house – 217 – 219 Greenwich Ave. I’ve been trying to research the date of its construction. I am also interested in finding out the past history of our 5 bay brick garage. Which at one time had large swing out doors ( like a barn) also – it has drains in the concrete floor. One elderly woman. Shirly Rubin said she grew up here and that her father was an ice man (the first in New Haven) He used the 5 bays to house his wagons. I can’t find anything about that part of its life. Shirly also said her father had built my house in 1910 – the records show it to have been built in 1920. Please help if you can – if not please guide me to a place that might help. Your Neighbor From Greenwich Ave. Your house does NOT appear in the 1888 atlas. So further research would require that you go the Hall of Records, City Clerk and go in land records vault. Begin with indexes starting with year 1888. Search “Grantees” and find either Lafoe or Maloney. Look up the Book and page indicated and you’ll find your house—or, at least, the lot. To verify date of construction, go to the library of the New Haven Museum and ask to see the city directories. (If you’re not a member, they’ll charge a fee just to enter building.) Look for Lafoe, Levi and/or Maloney, Elizabeth for each year, beginning with 1888 through 1901. Because directories were published the year after the data was compiled, the house likely was constructed the year before the 1st owner (either Lafoe or Maloney) is first listed in the directory—at your address. Sounds onerous, but in our neighborhood this actually is easier than some other parts of New Haven, because lots from that area which is bounded by Lamberton, Greenwich, Hallock and north side of Sea St. were not put up for sale until 1868 and boundaries were quite clear. South side of Sea St. to South Water St. is a bit more confusing, since deeds of original boundaries of properties often give descriptors that no longer exist, e.g. “a cart path”, “high water mark” [of area filled in long ago], etc.